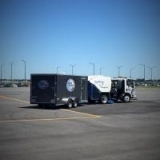 We are a parking lot cleaning business that maintains a variety of customer properties in the Cleveland area. Our many satisfied customers include managers and staff of office complexes, retail strip malls, property management companies, restaurants, hotels and condominiums. Sweeping your asphalt and concrete surfaces prolongs the life of your parking area, reducing the frequency of resurfacing and other costly maintenance. Those benefits are on top of the proven increased level of satisfaction your customers will have knowing you keep your facility's exterior clean and neat. Our power sweeping and related services provide even more benefits; give us a call today for a conversation about your needs. We also offer a FREE Professional Assessment — just ask! Porter Services will simply exclude mechanical equipment usage and removal of organic material. Your entire property will be hand picked including paved areas and grass areas, sidewalks will be cleaned with a broom and dustpan and trash liners can be changed. 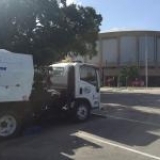 Our parking lot sweepers are available for event cleanings, daily, weekly and monthly parking lot maintenance programs that will keep your properties looking great.